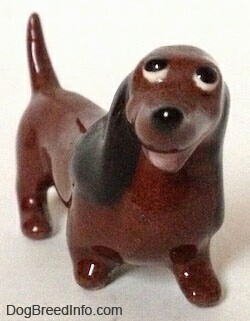 This is a group shot of the Hagen-Renaker Disney dog figurines that I own. They are all from Walt Disney's Lady and the Tramp except for Pluto. They were all designed by artist Don Winton. They were all produced for the opening of Disneyland and were made from the fall of 1955 to the fall of 1959, except for Pluto who was only in the line for 6 months in the fall of 1956. In the back row is Scooter. Next to Scooter is a second Scooter; they are item number 5002. Scooter is 1 inch tall. Next to Scooter is Lady the Cocker Spaniel, item number 5001 at 1 inch tall, a second Lady, Trusty the Bloodhound, item number 5013 at 2 inches tall, a second Trusty, Pluto, item number 5019 at 1 1/2 inch tall and Pedro the Chihuahua, item number 5006 at 1 1/4 inch tall. Ruffles (begging pose), item number 5003 about 1 inch tall, Fluffy (play bow pose) item number 5005 at 5/8 inch tall, a second Fluffy, and three Jocks (standing pose) in a row. 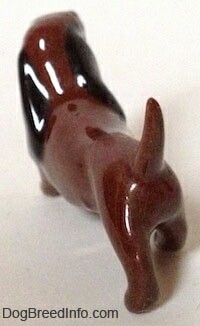 Jock is item number 5007 at 1 3/8 inch tall from the ground to the top of the ear, 1 1/2 inch long from the tip of the nose to the back of the tail and 3/4 inch wide across the back from hip to hip. 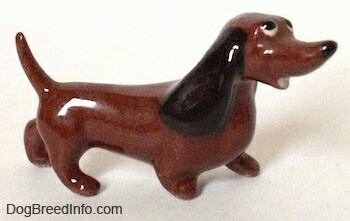 Pictured is a 1950s Hagen-Renaker miniature named Dachsie from Lady and the Tramp. 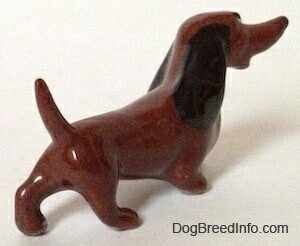 This brown Dachshund dog was designed by artist Don Winton and is item number 5011. 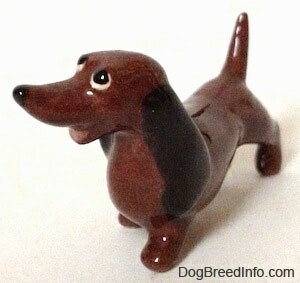 It measures 1 inch tall from the ground to the top of the head, 1/2 inch wide across the front of the chest and about 2 inches long from the back leg to the tip of the nose. 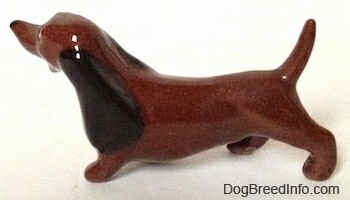 The piece is in excellent condition.